The brand version of a one-night stand is the above the line advertising campaign. Who is the best photographer we can afford? Who are the best models we can afford? What is the best location we can afford? Does anyone know a cheap stylist? The brand hires the photographer, model and stylist, does the shoot, selects the best shots and calls it advertising. This chain of events happens twice a year and follows the Spring/Summer and Autumn/Winter seasons. The objective is to connect with consumers with as little effort or investment as possible. 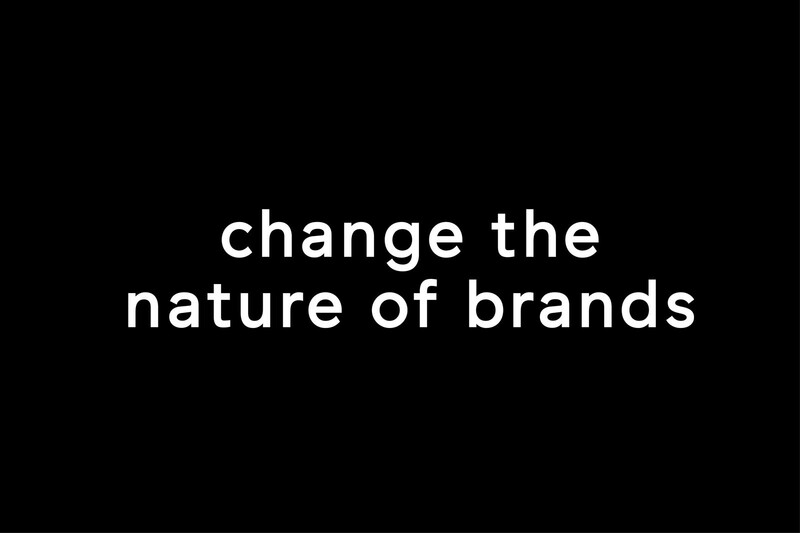 It is the brand equivalent of getting up, getting made-up, getting dressed, going out, getting wasted and getting laid. It is a superficial cycle of a brand with little meaning and zero confidence. These are yesterday’s analogue brands advertising in today’s digital world and we are about to step into an algorithmic tomorrow. A brand needs substance and depth to compete in today’s digital universe, and it is substance and depth that will unleash the potential of an algorithmic tomorrow. So why has the brand one-night stand lost its allure? The answer is simpler than it appears and is based on an outdated wholesale model. In this model, brands sell-in to third-party retailers who then sell to consumers. The brand makes minimal margin and suffers a loss of control but in return they get the certainty of big orders and wide exposure. Retailers buy two to four times a year, meaning brands have to support the deliveries with advertising two to four times a year. As a result, the brand abdicates its relationship with the consumer in favour of a relationship with the retailer – and then hopes that their one-night stand advertising inspires enough consumers to buy the product when the big orders are delivered. The issue is that as we continue to consume and interact with brands online, we don’t want one-night stands any more, We want meaningful relationships. The developments brought on by the world of the algorithmic tomorrow are changing our relationship with brands. Today, we can access all of our favourite brands online. We can order, receive, exchange and re-order all within the time span of 48 hours. However many analogue brands simply don’t have their brand, logistics or inventories set up to fulfil this present day reality. They have not established a brand meaning of sufficient depth to sustain a long-term online consumer relationship. New brands have solved this problem by using a vertical model, allowing them to sell their products directly to the consumer from both their own physical and online stores. Existing brands on the other hand, shy away from transitioning to this model because they are concerned that their existing retail relationships will suffer. This has led to a race to vertical, because at the heart of the race to vertical is a race to margin, and the vertical margin is twice that of the traditional wholesale margin. Basic economics dictates that companies who make twice as much profit with the same level of effort will thrive. Those that don’t adapt and stick to the traditional wholesale and one-night stand model will fizzle out and die. In order for the vertical model to be successful however, it needs substance. It needs consumers to be addicted to the brand, so they keep coming back to feed their addiction. This is not simply about e-commerce, it is about creating relationships. Consumers need to develop a meaningful relationship that is both fulfilling and reciprocal with their brands. The bane of this connection is a temptation driven by social media to feed the beast and publish endless content and opinion to the point where a brand’s communication, by virtue of quantity, becomes meaningless. Those in relationships will understand that sustaining a meaningful relationship is not about continuous, meaningless conversation. Instead it is about meaningful and useful communication, some of the time. For a brand to create powerful relationships it needs to cultivate a point of view. It needs to have a platform from which to pivot, and it needs a truth. This is especially the case for lifestyle brands that rely on one-night stand communication. To stretch the metaphor a little, they have gained a reputation, a reputation for hard-earned superficiality. This begs the question: is there any hope for these promiscuous brands? Thankfully redemption is possible for any brand, but redemption starts by cultivating a point of view and creating a platform from which to pivot. It starts with communicating a sense of credibility and behaving in a way that asserts authority. If a brand gets this right and establishes some meaning, then the future is bright. Algorithms will change the nature of brands. They already shape our lives, dominate the way our markets trade and calculate which medicines we prescribe. Simply put, an algorithm processes decisions and accelerates outcomes. They will make it possible for brands to evolve from simply connecting people to products, to connecting people to people. Targeting micro-trends and shifts in behaviour, brands will be able to unleash the power that resides in the consumer/brand relationship. Those brands we trust will be able to deepen our relationship with them. Lifestyle brands will be able to offer us more than just clothing and footwear. While the digital revolution has broken down the barriers, the algorithmic revolution will unleash brand equity. In much the same way computer-generated imagery changed what was possible in filmmaking, algorithms will change what is possible with brands and most importantly, make these changes able to be implemented. For brand owners this will create incremental income, for consumers it will create new products and services. In this future, urban squires could go shooting with “Barbour Estates”. Urban explorers could go to the North Pole with “Canada Goose – Expeditions”. Jeans could be cleaned, restored and refreshed by “Levi’s – Restoration” and sneaker heads could insure their collections with “Adidas Originals Insurance”. Think it and it will be possible. Creating meaning is the first step. The era of the one-night stand is over.